Jus’ Jerk | Eat It, Damn It! Reviews, raves, slams, and damns. As is the case for many Jamaican dishes, my grandmother’s Jerk Pork is my gold standard. Sorry, but many places just can’t live up. Grandma comes correct with everything she cooks, so every establishment has a steep mountain to climb. Add to it, my grandfather would not eat pork, so when Grandma made Jerk Pork, it was especially for me. 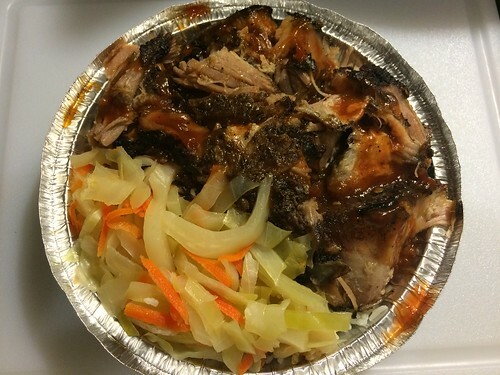 Though Jerk Pork may seem like something every Jamaican place has, not so. If there is pork on the menu, Rastafari won’t eat there. Therefore, in a Jamaican neighborhood, though restaurants abound, you may not find pork on all the menus. When I found a place called Jus’ Jerk, I was intrigued. I thought to myself, “You put in right in your name. Your Jerk best be right.” It was also possible that they only served Jerk Chicken. When I do find Jerk Pork on the menu, it’s always a mystery as to what I’ll get. What cut of pig will they use? Some make a chop, others use a shoulder. I’ve even seem some recipes that call for pork belly. How will it be prepared, slow and low in the oven, on a grill? Here’s what Jus’ Jerk provides as a medium ($11). As with most places, I had the choice of white rice or rice and peas. This is a source of contention in my family. My mother believes that Curry Goat should be had with white rice, while Jerk should be served with rice and peas. She’s a nice woman, so try not to judge her too harshly for this lunacy. I think that rice and peas overwhelm the subtle, smokey flavor of jerk marinade. Yes, “subtle”. Jerk should be complex, not just a mash of peppers and molasses. There should be heat, sweet, tang, and umami. The flavor and notes should be akin to good barbecue. IT WAS INCREDIBLE! The meat fell apart when pushed with a fork. Smoke, spice, heat, and sweet were abundant. It was perfectly cooked. I was amazed. I finally found the Jerk I’ve been looking for (that’s not at my grandmother’s place). They have three sauces to top your Jerk with, Mild, Medium, and Hot. I went with Medium. There was a little tingle on my lips after each bite, but not so much as to overwhelm the other flavors. The fluffy, well-cooked white rice went perfectly with my glorious meat. On a second visit, I had to get this dish again. It was as I remembered. Amazing. On another visit, it was a real struggle to try something else on the menu. However, faithful reader, I ventured into new territory. I got the Curry Goat (medium $11). Once again, I got cabbage and carrots, but this was very different and imparted an entirely different flavor to my entire meal. Though it looks like cold slaw, there is no mayo. It is a lightly pickled dish, sort of like cold slaw’s tarty cousin. It’s not so tart as to overwhelm anything, but just adds a little bite to the proceedings. The rice and peas are really good. The texture is right and it has the proper coconut tinge that really good rice and peas possesses. 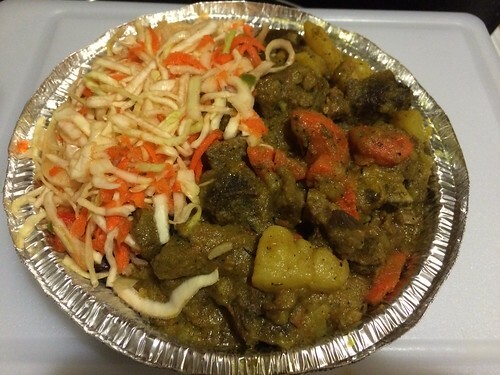 The Curry Goat is delicious, tender with just a little resistance. Though not the spiciest version of the dish I’ve had, the flavor was robust. More savory than hot, so even the most delicate of eaters will enjoy this dish. I highly recommend going with the cold veg. Two for two. Dare I tempt fate. Yes, I dare. This is the Oxtail (medium $11). Sadly, this was not the winner that the last two dishes were. The meat was a little on the tough side and the sauce was kind of boring. 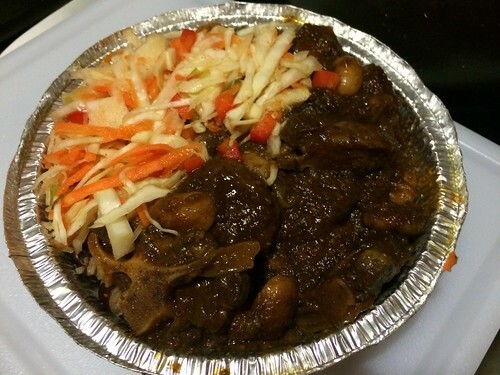 Granted, Jus’ Jerk charges much less for oxtail, but it does not entice me to try this again. Though not everything was a winner, I have been and will be a customer of Jus’ Jerk for a long time to come. Their Jerk Pork is the bees’ knees. The Curry Goat is really good. Though the oxtail missed the mark, I would have no problem trying out other menu items. Jus’ Jerk is mainly a take-out establishment, but there are a few tables available inside. Parking is abundant, but bring quarters for the meters. If you have a hankering for Jerk, this is a destination restaurant.